Massive bone loss, as a consequence of tumour resection, has been dealt with historically by a variety of techniques. This article describes the techniques commonly used in the management of intercalary, intra-articular and extra-articular resections with uncontained bone defects. Key words: bone tumour, knee, reconstruction, endoprosthetic replacement, allograft, vascularised fibula, massive bone defect. Prior to 1970 primary bone sarcomas had a less than 25% five-year survival and the primary surgical treatment was amputation. With the advent of chemotherapy and more advanced imaging techniques, it became evident that limb-sparing surgery was possible without affecting the overall oncological outcome and survival. Today patients with non-metastatic primary bone sarcoma have an up to 65% cure rate. 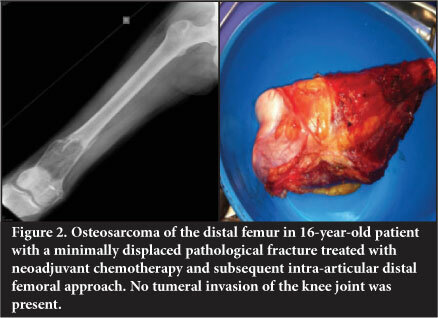 The most common indication for major structural allografts and endoprostheses is in orthopaedic oncological conditions. Seventy per cent of all primary bone sarcomas occur around the knee joint and are metaphyso-diaphyseal with frequent epiphyseal involvement. The management of these lesions is currently wide resection and adjuvant/neoadjuvant chemotherapy. Radiation is occasionally used post surgery.In 85% of extremity bone sarcomas, limb-sparing surgery is possible. 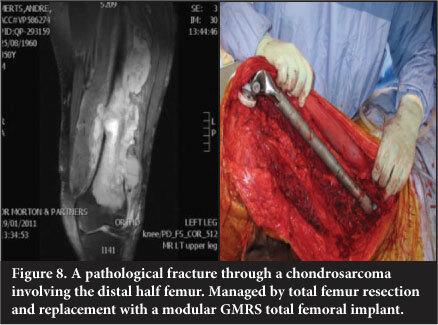 Patients with Anderson Orthopaedic Research Institute (AORI) type 3 defects requiring revision total knee arthroplasty (TKA) in the non-oncological population will occasionally require a so called 'tumour prosthesis' or bulk structural allograft when more conventional methods of reconstruction are not possible. The focus of this paper is on the management of bone deficiency in patients with primary bone tumours. Massive bone loss around the knee has been managed historically with a massive tumour implant, an allograft or an allograft/prosthetic composite. The technique of reconstruction used is dependent on the age of the patient, the size and location of the tumour, the histological grade, surgeon preference/familiarity and availabilityof graft material and implants, namely, bulk allograft and custom endoprosthetics. An intra-articular resection is where the joint is not involved,the tumour has not breached the joint and the resection is directly through the plane of the knee, i.e. the tibio-femoral articulation. 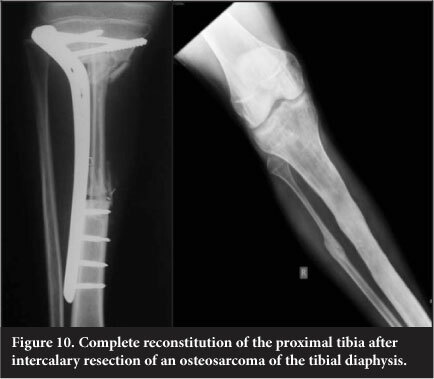 The majority of cases usually require an intra-articular resection of either the distal femur or proximal tibia. The affected segment of distal femur or proximal tibia is resected. This will invariably require division of the cruciate and collateral ligaments, capsule and periarticular muscle (Figure 2). An extra-articular resection involves the 'en bloc' resection of the joint with the resection lines being beyond the bounds of the joint. The tumour has penetrated into the knee joint by way of direct perforation through the articular surface or via the collateral or cruciate ligaments or as a skip metastasis.The resection entails complete resection of the knee en bloc with the corresponding defect of both the tibia as well as femur. The posterior cruciate ligament inserts approximately 5 cm below the posterior joint line and the resection margin needs to be clear of this. 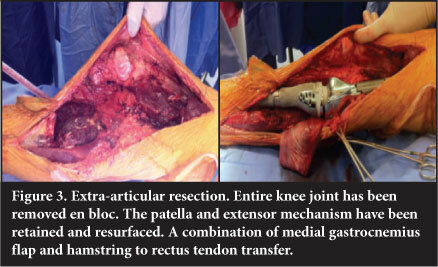 These resections involve significant muscle loss and will often require an arthrodesis or proximal tibial and/or distal femoral prosthetic replacement and associated tendon/muscle transfers to cover the implant and power the joint (Figure 3). Historically these massive bone defects have been reconstructed by either an endoprosthesis or a bulk allograft and considerable debate around this topic still persists. Intercalary resection involves resection of a diaphyseal section of the bone with the joint remaining intact. Adjuvant chemotherapy has been shown to delay union as well as increasing fracture risk5 and radiotherapy decreases the osteo-inductivity of an implanted allograft. This makes it a less desirable option in oncology patients. Dissolution is due to an immune response with development of class 1 lymphocytotoxic antibodies in a haematoma around the graft. This causes a T-cell-mediated response with class 1 and 2 antigens being recognised.Subsequent osteoclastic resorption at varying depths of the graft occurs and there is a chronic immune response from the depot of antigen. 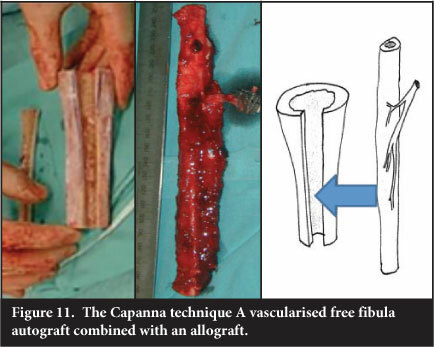 This process occurs to a lesser extent with processed allografts, occurring least in freeze-dried allografts,but with a concomitant reduction of graft strength andhigher risk of fracture. Surgical technique can play a role. Antibiotic-laden cement filling of the allograft canal as well as adequate soft tissue cover flaps can lower infection rates. Non-union incidence can be minimised by stable fixation. Intramedullary nailing/prosthetic stem with a step-cut interlock between graft and host bone is superior to plating (Figure 4). Revision TKA with structural bulk allografting is associated with an up to 20% complication rate, usually related directly or indirectly to the allograft itself.10 For this reason endoprostheses are favoured by some authors. Many authors have reported poor long-term results and poor function13 leading to high conversion rates to rotating or fixed hinge implants. Arthrodesis implants are commercially available and are technically less demanding than allograft reconstruction. Initial attempts to bridge large bone defects with endoprosthetics were first performed by Gaenslen prior to1930, using fabricated ivory. Vitallium was subsequently used by Moore and Bohlman in 1943. Kraft and Levinthal used acrylic to reconstruct a distal femur in 1954. Monticelli and Santori advocated the use of stainless steel implants and introduced the concept of modularity in 1975. In 1975, Scales in Stanmore (UK) reported an 80% success rate using titanium segmental implants in over 300 cases. These developments have led to the availability of the modular endoprosthetic replacement implant which is now widely used in orthopaedic oncological reconstructive procedures. 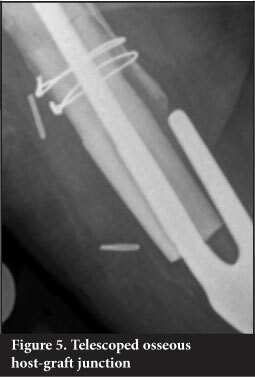 Reconstruction by insertion of an endoprosthetic replacement has become more universally recognised as the procedure of choice in this situation of massive bone loss around the knee. 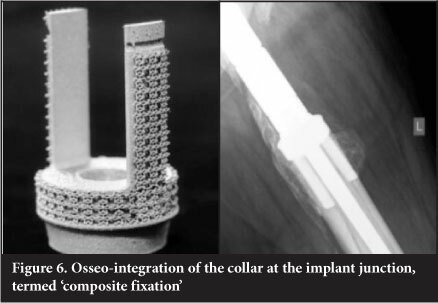 The high failure rates of loosening with fixed hinge cemented implants - 46% risk of revision at 10 years14 have been addressed with the rotating hinge prosthesis which has a reported failure rate of 3% at 10 years.14,15 In addition the concept of composite fixation has contributed to improved outcomes. A porous collar allowing for composite extracortical fixation16 was introduced by Chao in 1983 and subsequently most tumour endoprosthetic manufacturers have incorporated this feature in their implants (Figure 6). The concept is similar to extracortical bridging callus in bulk allografts. Endoprosthetic replacement insertion is technically easier than fashioning an allograft and has the additional benefit of permitting immediate post operative weight bearing and movement and has a less complicated post-operative course, thereby facilitating adjuvant oncological management. Fixation of the stem through interference press fit does not provide intimate bonding due to the straight geometry of the often encountered mid-cortical diaphysis. A fibrous layer is formed which may consolidate to bone if micromotion is prevented. Fixation may be enhanced by porous and HA coating. Cement due to its low modulus of elasticity allows gradual transference of stress to bone. To date this still displays the best long-term survivorship. Porous coating of an implant enhances osseo-integration. This can paradoxically also then act as a stress riser in cases where diaphyseal fixation alone is employed, leading to bone resorption and ultimate stem fracture. Modularity has made for easier surgery with no change in implant survival. The reported survival rates of cemented stem prosthetics with an hydroxyapatite porous collar are higher than with cementless fixation.14,15 However, a great deal of controversy still exists as to which modality is superior. A central registry similar to the Swedish/Norwegian one does not exist for custom endoprosthetics. Infection rates of up to 11% have been reported.17 This is more common in the paediatric extensile, proximal tibial replacements, pelvic and previously irradiated group of patients. Should infection occur, two-stage revision is successful in 72% cases, with a 32% probability of amputation if the second stage procedure is unsuccessful. The infection rate with endoprostheses is significantly lower in the non-oncological group of patients. Overall survival rates for large endoprosthetic replacements around the knee have been reported as 60%-90% at 5years and 40%-80% at 10 years, with the worst overall group being the proximal tibial replacements. It is imperative that adequate soft tissue cover over an implant or graft is obtained. 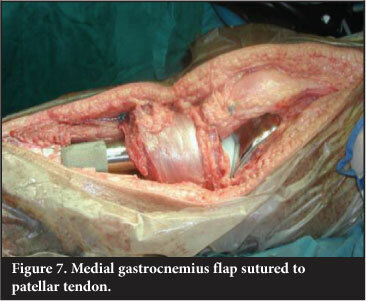 Use of a medial gastrocnemius flap to cover the defect associated with a proximal tibial endoprosthetic replacement has reduced infection rate from 25% to 6%.20 The medial half of gastrocnemius is transposed anteriorly and the patellar tendon is sutured directly to the flap. This reconstructs the extensor mechanism and allows for good muscle cover (Figure 7). An extensor lag is usually evident.Patients are educated to compensate by 'back-setting' the knee in the stance phase of gait - usually with a rotating hinge-type knee prosthesis. Soft tissue loss in distal femoral replacement is less frequently encountered. Usually two of the quadriceps group of muscles remain in Enneking type 2b resections. Occasionally it is necessary to perform a hamstring to rectus tendon transfer or a latissimus dorsi free flap. Total femur replacement is used in massive reconstruction as an alternative to through-hip disarticulation in extensive tumours and/or where inadvertent contamination has occurred. It has applications in revision surgery where patients have an ipsilateral failed hip and knee prosthesis with massive bone loss (Figure 8). Intercalary defects are significantly easier to manage and have a superior functional outcome. Bone transport is seldom used due to the high maintenance demands of the procedure combined with adjuvant oncological treatment. It is useful in lower grade sarcoma, e.g. grade 1 osteosarcoma, adamantinoma where chemo-and or radiotherapy is not required. Usually the defect post tumour resection is too large to be bridged by an autograft and a vascularised free fibula is preferable. Vascularised free fibular transfer was first described by Taylor et al in 1977.24 The fibula is noted to incorporate and hypertrophy, however and has been associated with high rates of fracture. Various modes of fixation have been advocated. 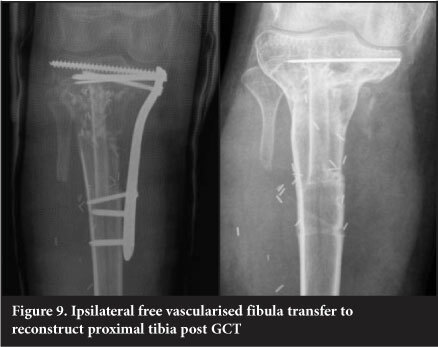 The use of a 'slot in' technique whereby the fibula is firmly compressed into the defect has been utilised at our unit since 2003 and has become the mainstay of treatment for intercalary defects. This is combined with titanium plate internal fixation (Figure 9). This has a success rate of 96%, with fracture occurring in 7.6% of patients. The presence of a fracture is usually associated with exuberant subsequent callus formation which increases the strength of the graft. The fibula is fixed directly to the cortex into a slot as opposed to being centralised in the canal and is always slotted in under pressure to stimulate the graft. The use of more flexible titanium plates is also felt to assist with graft stimulation. Complete remodelling of the shaft is an expected outcome (Figure 10). Endoprosthetic replacement of the diaphysis is usually indicated in metastatic disease with a poor long-term prognosis where an immediate weight-bearing reconstruction is needed, as opposed to intramedullary nail fixation.This procedure has been used in a small series to reconstruct intercalary defects in primary tumours but is not the method of choice and is associated with high complication rates.27 Tibial diaphyseal endoprosthetic replacement has been reported in recent publications as having a 22% infection rate. 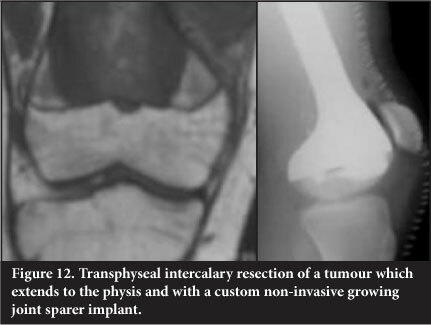 More recently transphyseal resection in children with bone sarcoma has been advocated.28 With careful planning and technique the bony margins of resection are significantly closer with no appreciable increase in local recurrence rates in carefully selected patients. 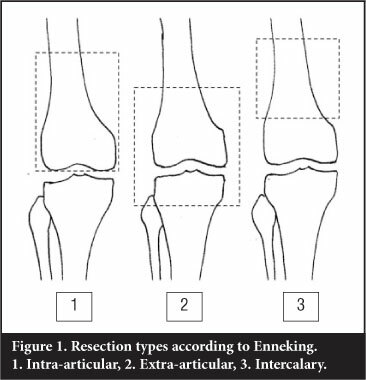 Reconstruction is performed using a custom-made joint-sparing endoprosthetic replacement (Figure 12). Computer-assisted surgery/navigation has improved the accuracy of the cut and therefore the fit of the custom endoprosthesis, which in the young child is usually a non-invasive growing implant. The surgical management of massive bone and soft tissue loss around the knee is challenging. The techniques and developments in the field of limb-sparing surgery that have evolved over the past few decades in the treatment of orthopaedic oncological disease have greatly improved limb salvage rates. This group of patients is immunocompromised and it is essential to perform the procedure with the lowest complication rate to facilitate resumption of chemotherapy/oncological management. Advances in prosthetic engineering as well as the understanding of the biology of allografts should lead to more consistent and predictable outcomes.